On 10 March 2017, an oldest hierarch of the Orthodox Church of Antioch, Metropolitan George of Mount Lebanon, received in his Brummana residence hegumen Arseny (Sokolov), representative of the Patriarch of Moscow and All Russia to the Patriarch of Antioch and All the East. They were joined in then meeting by academician Suheil Farah, honorary president of the Lebanese-Russian House. Rev. Arseny thanked Metropolitan George for his attention to the needs of the representation of the Moscow Patriarchate in Beirut and particularly for his blessing to allocate without charge a plot of land for a Russian cemetery near the Nourieh monastery located on the canonical territory of the Mount Lebanon Metropolia. 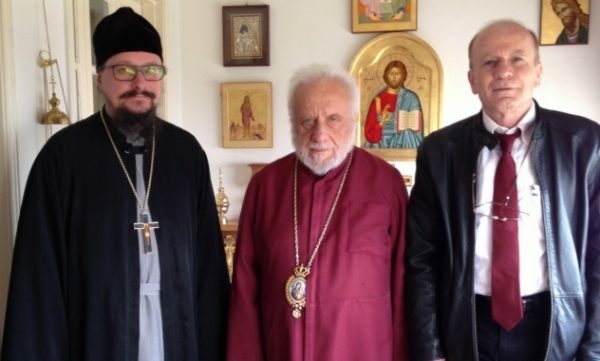 Representative of the Russian Orthodox Church told Metropolitan George about the activity of the representation and the life of his parish in Beirut and informed him of the willingness of certain education institutions of the Russian Orthodox Church to accept students from the Church of Antioch. Young candidates were discussed. Hegumen Arseny wished Metropolitan George the blessed time during Lent and joyful celebration of Easter and presented him Metropolitan Hilarion’s book ‘The Sacrament of Faith” published recently in the Arabic language.